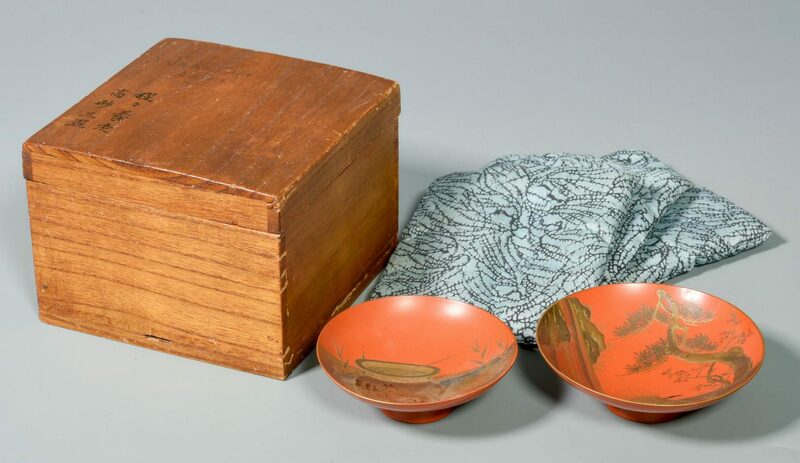 Group of 19th and early 20th century Asian Items. 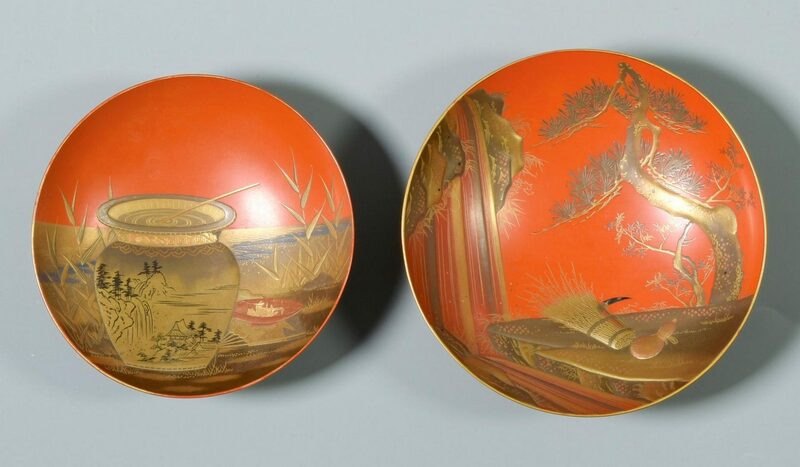 1st group: Signed pair of stacked red lacquer sake cups with circular shallow cups and short ring foot and decorated with gold and black hiramaki-e and takamaki-e still-life and landscape, both with character marks for Shomosai on red lacquer base. Cups – 1 1/8" H x 3 5/16" dia. and 1 1/4" H x 3 3/4" dia. 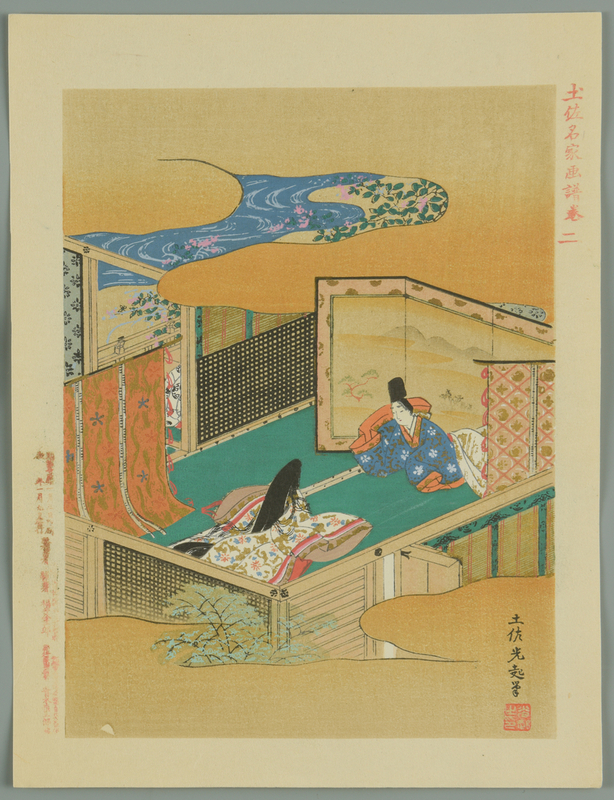 Edo period, working late 18th-early 19th century. 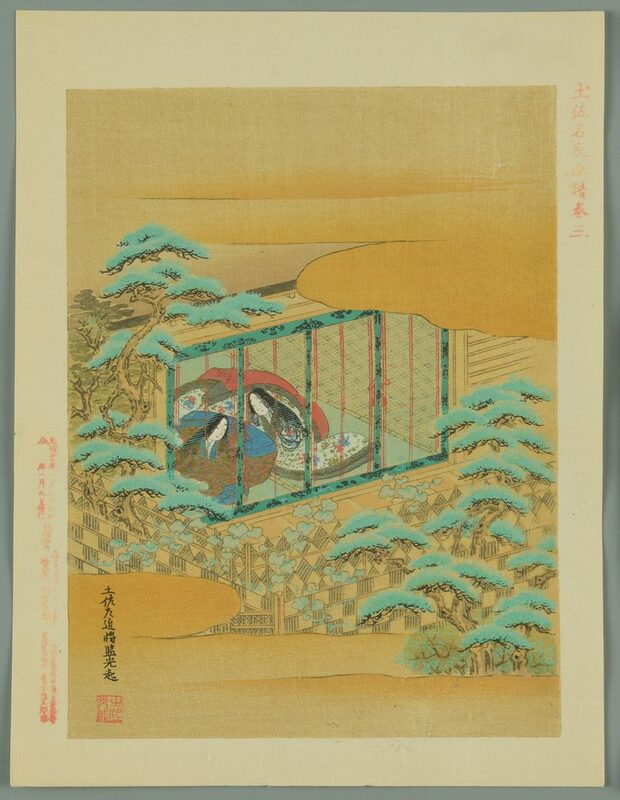 Housed in a wooden storage box with silk cushions. 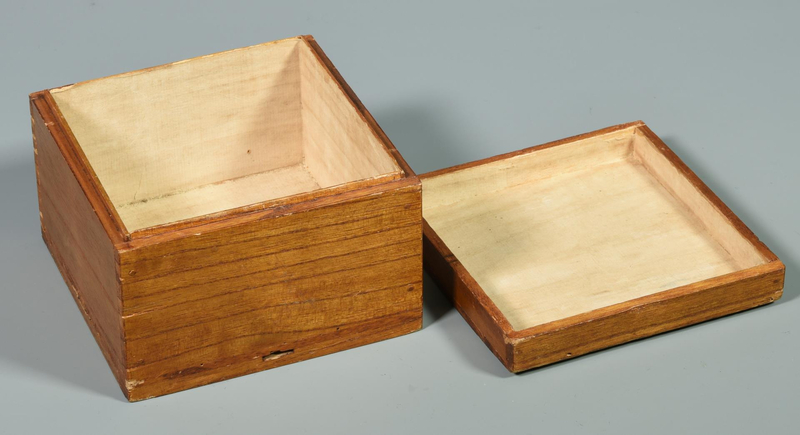 Outside cover of box with black ink character marks and handwritten "3 Saku Cups". 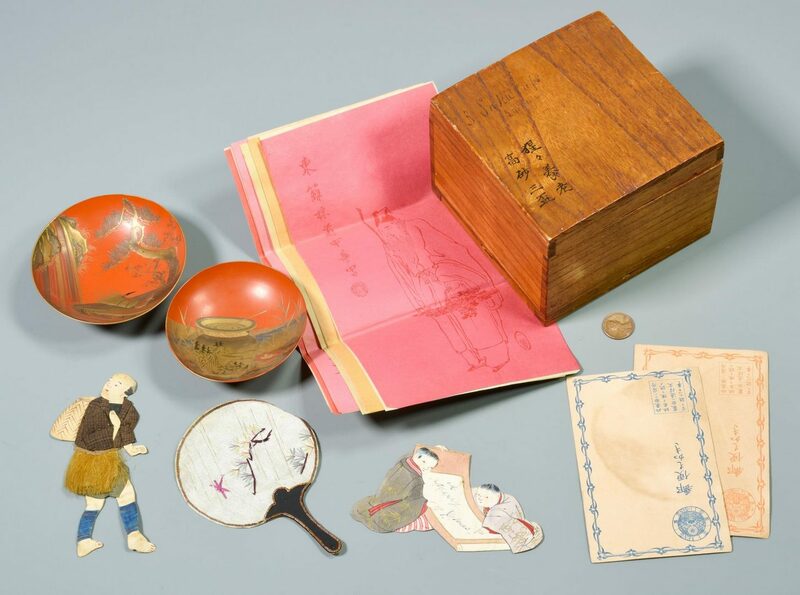 Box – 3 3/4" H x 5" W x 5" D. (Note: Set originally included 3 cups) 2nd group: Cloth and paper cut-out of standing Asian man with cloth bag and jacket with hair skirt, 5" L; paper and silk cut-out of 2 Asian children seated and holding a scroll that reads "A Merry X mas", 4 1/2" L; and cloth cut-out of a round hand fan with decorative details in thread, 5" L. All early 20th century. 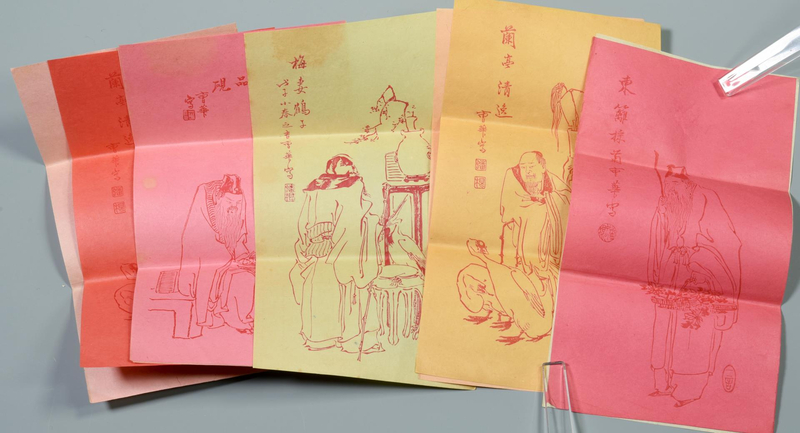 3rd group: Group of 10 folded woodblock prints of 4 different Asian scholars of various shades of paper. 8 7/8" H x 5" W. All early 20th century. 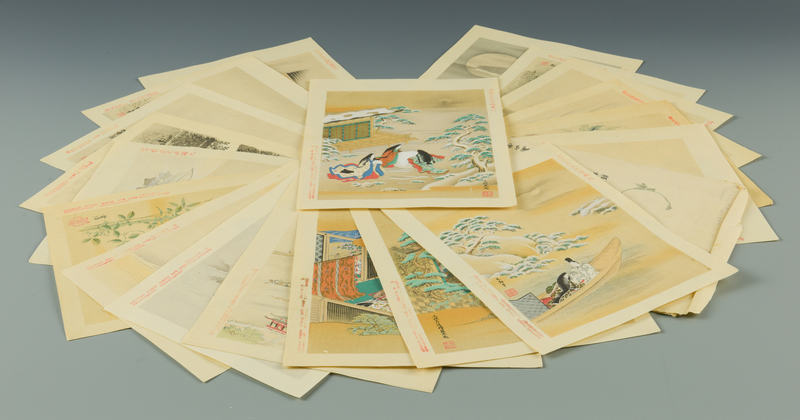 4th group: Pair of Asian postcard type paper cards with Asian characters, postage marks and decorative borders. 4 7/8" H x 3 1/8" W. All early 20th century. 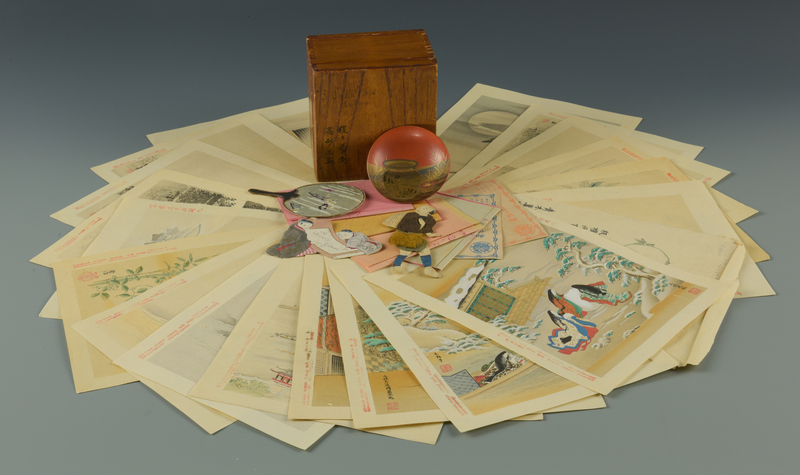 5th group: Grouping of Japanese woodblocks after famous Japanese artists, including Tosa Mitsuohi, Yosai, Tanyu Kano and Tsunenobu Kano among others. All unframed and measuring 10 3/4" H x 8" W. All late 19th/early 20th century. CONDITION: 1st group: Overall very good condition. Note that one sake cup is missing from group. 2nd group: Some wear to be expected from age. 3rd item: Slight water stains and other minor wear. 4th item: Stains on surface of cards. 5th grouping: All very good condition.